When you’re faced with adversity there are two ways to approach the situation. You can back down and accept your fate, or you stare it in the eye and do whatever it takes to succeed. 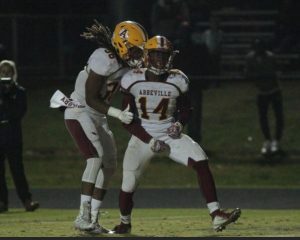 The latter happened Friday night as the Abbeville Panthers punched their ticket to the AA State Championship game with a 28-21 win over Southside Christian. In a back and fourth game the Panthers found themselves trailing 21-20 with 2:35 remaining in the 4th quarter. Charlie Paciocco, whose kicks had sailed eight yards deep into the endzone all night, kicked off from his own 40 yard line. The kick was a low line drive that bounced at the 5 yard line and landed in Cortney Jackson‘s hands at the one. Jackson leans to the left, pacing himself as a wall of blockers formed in front of him. A lane opened near the Abbeville bench. Jackson hit the afterburners, dodged a SSC defender near mid field and the rest is history. A 99 yard kickoff return for a touchdown to send the Panthers to Benedict for the fourth consecutive year, will without a doubt be a play that will be talked about for generations. The Panther faithful that made the trip to Simpsonville were elated. They just witnessed history. A deafening silence fell over the SSC sidelines and home stands as their season came to an abrupt end. There’s no consolation prize for a game well played, but SSC deserves some credit. They were tough as nails and pushed the Panthers harder than any opponent since last years State Title game versus Bamberg-Erhardt. recognition in this game as well. The offensive line played very well, and had to move massive defenders all night. The running backs blocked hard for each other. The defense played as well as you could hope for. Especially with 2:18 left on the clock and a high powered offense trying to put together a game winning drive. Dylan Beauford played as big of a role in the win as anyone. Every single kickoff that boomed off of his right foot went at least eight yards deep into the endzone. He hit every PAT and also connected on a 20 yard field goal from a very tough angle. He hit a 47 yarder in the 4th quarter to put the Panthers up 20-13 with six minutes left in the game. Beauford’s eight total points scored in the game proved to be the winning margin and without his powerful, accurate leg, who knows what the outcome would have been. A total team effort led to one of the most memorable victory’s in Panther football history.